Note to readers: The death last week of motorcycle daredevil/bonebreaker Evel Knievel prompted this recollection of a rather bizarre late 1980s interview in Dallas. Like father, like son? Definitely yes and no. Original publication: March 23, 1989. Evel Knievel, 50, flabby but still formidable, has decided to roll up a pants leg, roll down a sock and show a few reporters a patch of his scarred, blotched skin. "I realized I had lost my healing power," he says of his 1976 motorcycle jump over a tank of sharks at the Chicago Ampitheater. "When you get broken up as bad as I was broken up, it takes a certain amount of red cells to help you heal. When you run out of those, what happens is your skin discolors." The Chicago jump, the last in which he sustained major injuries, left him with two broken arms and a concussion, according to a press release labeled "Evel Knievel's Career Highlights." The release also states, "Marked first time in a Knievel show that a non-participant was also injured; cameraman was hit and eventually lost eye." Evel's last jump was in 1980, during show with his son, Robbie, a k a Evel II. The kid was jumping 15 or 16 cars a crack, the old man five or six. "I had just run out of nerve," Evel says. "I couldn't pull the trigger anymore." Evel and Robbie are in Dallas this week trying to trigger interest in an April 14 pay-per-view television event titled Knievel Legend Continues: Can Son Avenge Evel's Crash? For $14.95, cable subscribers can watch Robbie attempt to jump his motorcycle over the Caesar's Palace water fountains. Evel last tried it on New Year's Eve, 1967. The damage: a collection of broken bones and a monthlong coma. 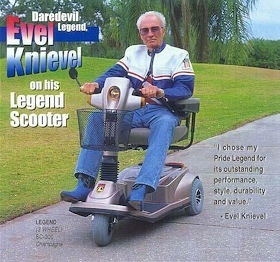 But Evel figures Robbie can do what he couldn't. Whatever the outcome the take will be a "minimum of a couple of million dollars." 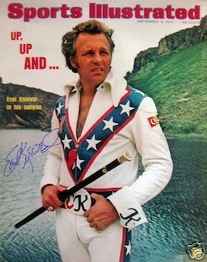 Evel made only $15,000 for his crash landing at Caesar's, but the hotel paid his hospital tab. Robbie says he's been obsessed with making the jump. Evel says he talked Caesar's into it. "I had to convince them that I was the last guy in the world that wanted to pick up a bleeding, crumpled body off the asphalt at Caesar's Palace, especially if it was my kid." The father-son relationship is interesting. Father does most of the talking, son mostly endures it during a get-together in a Dallas hotel suite. "Coffee and Danish! Let's bring up some whiskey, women and fresh horses!" Evel bellows. Next he's ragging the kid. "Geez, you eatin' again? You gotta lighten up. You've got a jump to make." Evel says he's been trying to talk Robbie into making some real dough by heading a traveling show called "Evel Knievel II's World of Wheels." "I think it could be a very lucrative thing," he says before Robbie quietly retorts, "You want to baby-sit me." "Well, you said you wanted to work." "I've got my own plans." "Yeah, I know. I don't listen to that . . . You say you want to work. Whenever I come up with a job or an idea that calls for real hard work, you want to go out the door. He ain't foolin' me none." Evel laughs. Later he recounts the many times he warned Robbie against living a life of motorcycle daredeviltry. But Robbie says he "liked the spotlight," which first shone on him as an 11-year-old doing wheelies in his father's shows. At age 17, Robbie decided to show dad he didn't need him. "He ran into some little (expletive) in an exercise joint," Evel says. "And she said: 'You're a star yourself. You don't need your father.' So he took her to Montana. In two weeks they turned off his phone and his power. She realized that she'd married a professional bum." Evel recalls, with some relish, the "knock-down, drag-out fight" he had with his son in a Houston bar. "It took three cop cars and about nine guys to break it up." They were estranged for a while, but Evel says Robbie came to him a couple of Christmases ago and patched things up. Now they're in business together, and the Caesar's Palace water fountain jump is their first big splash. "He's a much better professional at what he does than I ever was," Evel allows. Mouth-to-mouth, it's still no contest. "I'm my own man and I've got my own way of life now," Robbie says quietly. "You just do what I tell ya!" Evel booms from the other side of the room. "You think you're a grown man. You're still a little baby to me. Just shut up." The both laugh at that. Evel out-laughs his son.